Last night Austeng and Imagine Intelligent Materials jointly won an award for the establishment of Australia’s first commercial graphene plant. 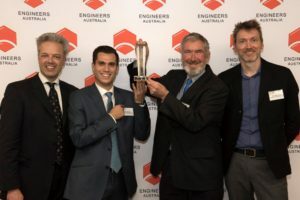 The Australian Engineering Excellence Awards, Victoria, saw Austeng (a Geelong-based engineering company) and Imagine IM (a graphene technology company) take out the Innovation, Research and Development category. The pilot plant has a capacity of around 10 tonnes per annum of the carbon-based nanomaterial, and was officially opened in North Geelong in June.